We was thrilled to be able to test out the 1st JCB playset from golden bear, Raiden loves anything cars/diggers. I was quite pleased that it was only on a few parts that I could assemble with Raidens help and he popped the stickers on all by himself. So it was pretty straight forward if a five year old could do it. There is nothing more frustrating when there is a hundred pieces together and you have a very excited child. 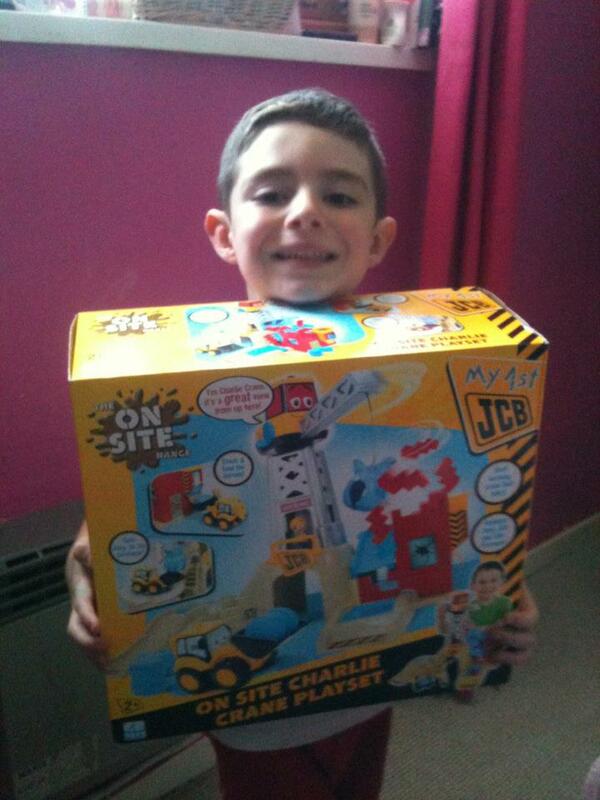 Busy, on-site construction action with Charlie Crane, Joey JCB and the Site Foreman. 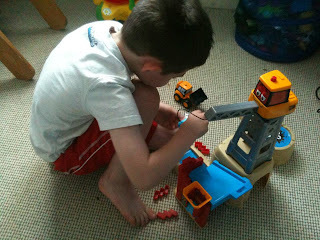 This rugged, child-powered playset features a working talking crane with a giant crab claw and wrecking ball, bricks to stack and knock down, barrels to transport and load and it even comes with a turntable, ramps, a tunnel and garage to keep Joey JCB on his game. It's a 360 adventure for little builders and wreckers everywhere! For the ultimate in construction play combine your Charlie Crane with the new On Site Rock Loader Playset for a fully interactive JCB experience. Raiden loved the part where you could knock done the wall, he used he's other cars to slide down the ramps and was very content in playing with the playset. The set is 2 years+ I do think it suits maybe 3+ years as I think the plastic is slightly on the thin side. Raiden has heavy hands and I was worried about it snapping. I think it's a playset that will give years of fun and suit older children too. The Playset RRP is £34.99 & i think if it was more sturdy it would be a great price. There is also any additional rock loader set which goes alongside Charlie crane too.